Corporate earnings season kicked off in earnest on Friday (April 12) with JP Morgan and Wells Fargo getting things started. It was a “tale of two tapes”, with JP gapping higher and WFC drifting lower. There will be a lot more corporate earnings on deck in the coming weeks. With equities continuing their strong run this year—S&P 500 +16% and TSX +15%, returns that would represent a great annual performance—many are wondering where the market goes next. This earnings season may take on added importance or prove to be a tie breaker between the equity and bond markets. The question investors are asking is whether to believe the bond market or equities – because both are telling opposite stories. The U.S. 10-year yield, which was over 3.2% six months ago, bottomed in late March below 2.4% and has yet to move meaningfully higher. That is typically an indication that future growth and inflation expectations are muted. Meanwhile equities are coming of their best quarter since 2013. A slowing economy and the equity markets can go in the opposite direction for a spell, but not forever. Equities markets will need to see an improvement in economic data at some point to continue the upward direction; in the meantime earnings may become a key driver. This situation adds some risk as this corporate earnings season could be a challenging one. 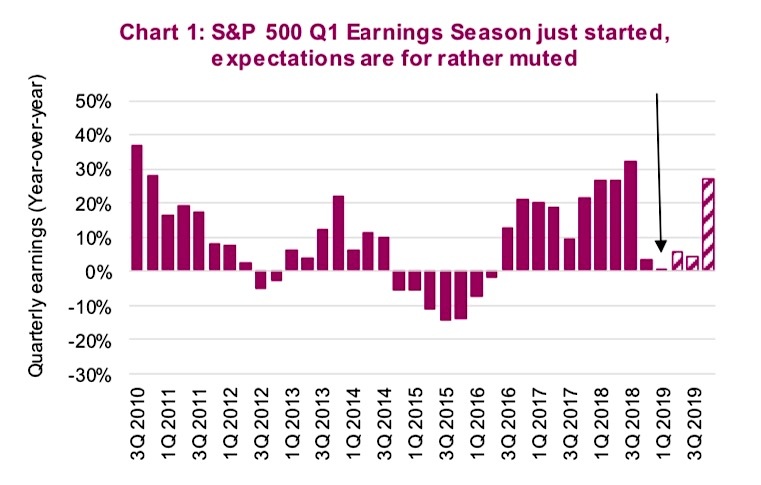 To start, S&P 500 first-quarter earnings are expected to be flat from a year ago (Chart 1 below). Certainly, comparable figures from 2018 are inflated due to corporate tax cuts in the U.S., so perhaps the market will not give much mind to flat growth…but we will see. 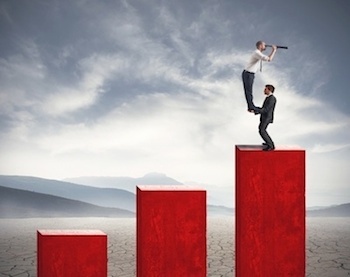 Sales will be key to providing some insight into how companies are managing in this slower economic patch. First-quarter corporate earnings estimates for the S&P 500 have been trending down for some time across every sector (Chart 2 below). 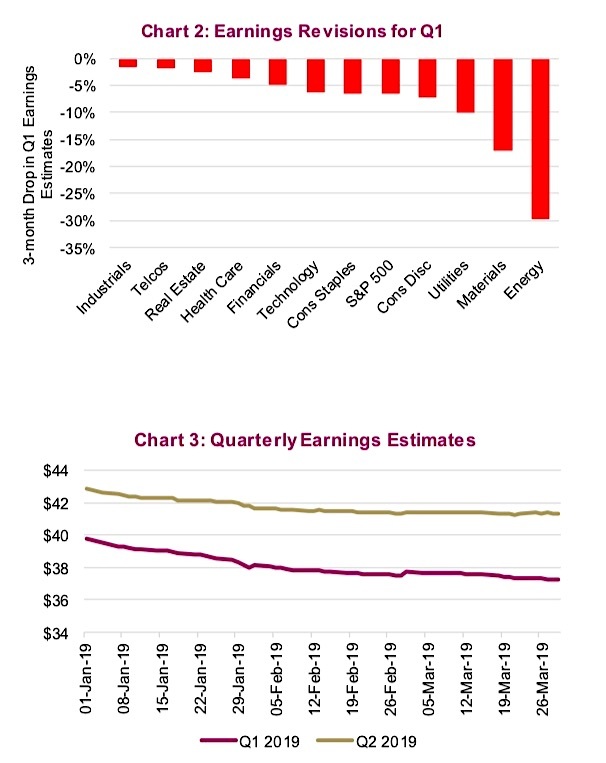 On January 1, 2019 estimates sat at $39.82 and with the corporate earnings season just kicking off, they are down 6.5% to $37.23 (Chart 3 below). There are a host of factors that have analysts reducing estimates with the biggest being the softening trend in global economic data over the past six months. While equity markets have recovered nicely, the data has largely remained soft. In addition, we have seen several companies report earlier this year citing soft activity in Europe and China. A 6.5% drop in earnings estimates over three months is significant but we wonder, should it be more? Consensus earnings estimates are based on all analysts’ forecasts across all the index constituents. Many analysts will change their forecasts when they believe the outlook has changed. In contrast, other analysts will wait for the company to report and update their estimates at that time. This second group may still be posting estimates that are higher than they should be, just waiting to publish an update after Q1 earnings. If you factor that into the average, perhaps estimates may fall even further. Another challenge for this earnings season is currency. The U.S. trade-weighted dollar averaged 90.2 in the first quarter of 2018 compared to 96.5 in the first quarter of 2019. This is important for two types of companies: big importers and exporters/multinationals. Importers, like Walmart, benefit from a stronger currency for buying goods. While hedging is typically active, there is an impact that may help earnings/margins. But the net impact of a higher U.S. dollar is negative: exporters clearly get hurt as do companies with non-U.S. sales/operations. Depending on how you measure about 30% of S&P 500 sales are non-domestic. As a result, currency will be a drag this quarter. 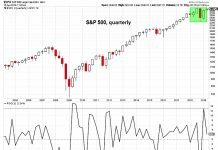 The equity market’s strong performance this year can be attributed initially to the bounce off oversold level. It was then lifted higher by the U.S. Federal Reserve stepping to the sidelines. 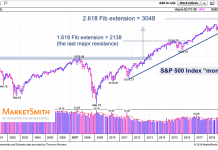 At this point, any further climb will require either (a) more improvement in economic data, which will dispel concerns that we’re on the verge of heading into a recession; or (b) a great earnings season. We don’t believe the latter is on the cards for the first quarter, so it may be up to the data. That will likely lead to some bigger volatility in the coming months.